WINTER STRIKES BACK, IT’S TIME FOR SOUP! With that thought in mind, it is surprising that a soup that simmers zucchini for 45 long minutes could be so perfect, but it is. Until now, my default zucchini soup was from Chocolate and Zucchini, a version that adds a touch of sesame in the form of tahini paste. With this curried zucchini recipe, I found a serious contender for the number 1 spot. I will consider that a tie, and enjoy them both! Add the zucchini chunks, shallots, curry, ginger, and mustard into a saucepan. Pour the chicken broth over it, add the raw rice, and bring to a boil. Cover the pan and simmer for 45 minutes. Puree the mixture using a hand held blender, or pass it through a food mill. Season with salt and pepper. Add 1/4 cup of heavy cream, taste it and add more if you like it richer. The soup can be served hot or chilled. 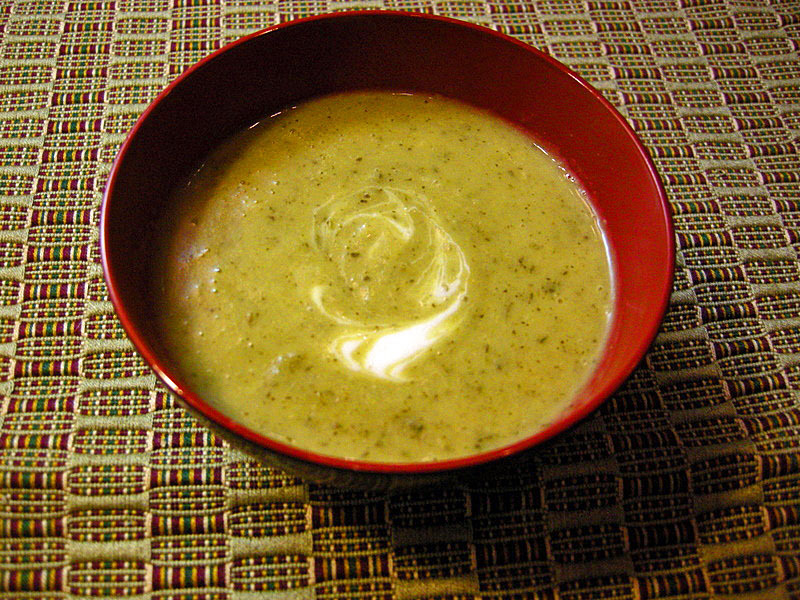 Comments: Until I tasted it, I wasn’t sure I would like this soup, thinking the zucchini would have lost all its brightness from the long simmering. The first spoonful got my silent appreciation, suddenly interrupted by Phil’s words “wow, this soup is really good!” With heavy emphasis on the “really.” The curry and the ginger perform some kind of magic to restore a sense of freshness to the zucchini, which retains a nice green color. I reduced quite a bit the amount of heavy cream called for in the original recipe, but indulge if you prefer, and go for one and a half cups of it. Adicione os pedaços de abobrinha, enchalota, caril, gengibre e mostarda em uma panela. Despeje o caldo de galinha, adicione o arroz cru e leve para ferver. Tampe a panela e cozinhe por 45 minutos. Faca um pure com a mistura usando um liquidificador ou processador de alimentos. Tempere com sal e pimenta a gosto. Adicione 1/4 de xícara de creme de leite, prove e adicione mais 1/4 se preferir. A sopa pode ser servida quente ou gelada. very delicious, I used the full 1/2 cup heavy cream, it was perfect for our taste. Don’t think that any more cream would make it better. thanks for another great recipe, Bewitching Sally! So glad you enjoyed it! The weather will turn a little cold again this weekend, perfect for soup, I have a cauliflower soup recipe that is calling my name!